Reference number for this case: 2-Oct-54-Comines. Thank you for including this reference number in any correspondence with me regarding this case. Lille, October 4 -. 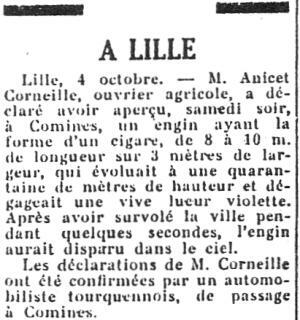 Mr. Anicet Corneille, farm worker, stated to have seen, on Saturday evening, in Comines, a machine having the shape of a cigar, from 8 to 10 meters in length, of three meters of width, which evolved at forty meters hight and released a sharp purple gleam. After having flown above the city during a few seconds, the machine is said to have disappeared in the sky. The statements by Mr. Corneille were confirmed by a motorist from Tourcoing who was passing in Comines. Luc Chastan indicates in his data base that in the Nord in Comines on October 2, 1954, at an unknown hour, the "witness, farm labourer, stated to have seen in the evening, a machine having the shape of a cigar, from 8 to 10 meters in length, by three meters of width, which moved at a forty meters height and released a sharp violet gleam. After having flown over the city during a few seconds, the machine allegedly disappeared in the sky. The statements of the witness were confirmed by a passing car driver." The source is indicated as "Le Méridional". The website indicates that on 2 October 1954 in the evening in Comines, France, one object was observed. The sources are indicated as Michel, Aime, Flying Saucers and the Straight-Line Mystery, S. G. Phillips, New York, 1958; Vallee, Jacques, Preliminary Catalog (N = 500), (in JVallee01); Newspaper Clippings. A Comines, le 2 octobre 1954, un engin, ayant la forme d’un cigare mais dont les dimensions, 30 mètres de long et trois mètres de large, font plus penser à celles d’un avion, a survolé le ciel pendant quelques secondes. Plusieurs témoins affirmeront qu’il dégageait une sorte de lueur violette. Cette année 1954 a été sans précédent pour l’ufologie car le phénomène touchera toute la France où de nombreuses observations ont été relevées. 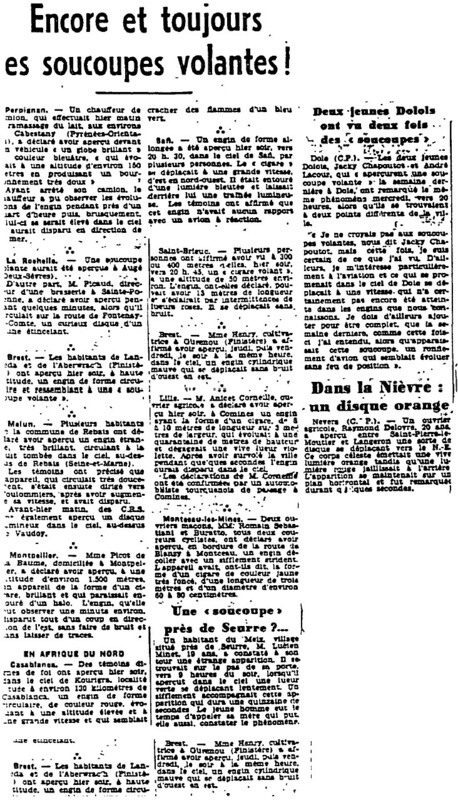 [yr1] Article in the regional newspaper L'Yonne Républicaine, page 3, France, October 5, 1954. 0.1 Patrick Gross March 17, 2006 First published. 1.1 Patrick Gross June 4, 2010 Addition [la1]. 1.3 Patrick Gross December 21, 2016 Addition [ub1]. 1.5 Patrick Gross January 11, 2017 Additions [nr2], [dn1].